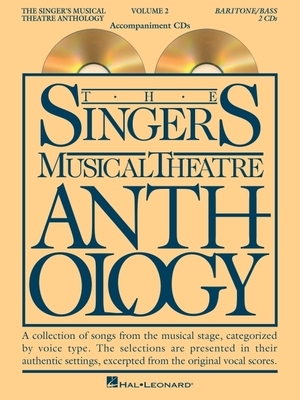 The Singer's Musical Theatre Anthology - Volume 2 (Other) | The Drama Book Shop, Inc.
(Vocal Collection). Two accompaniment CDs in each package which match the books containing a collection of songs from the musical stage, categorized by voice type. The selections are presented in their authentic settings, excerpted from the original vocal scores. Contents: ANNIE GET YOUR GUN: The Girl That I Marry, My Defenses Are Down * ANYTHING GOES: All Through the Night * BELLS ARE RINGING: Long Before I Knew You, Just in Time * THE BOYS FROM SYRACUSE: This Can't Be Love * CAN-CAN: It's All Right With Me * CAROUSEL: The Highest Judge Of All * DO RE MI: All of My Life * GENTLEMEN PREFER BLONDES: Bye Bye Baby * GUYS AND DOLLS: My Time of Day, Luck Be a Lady, More I Cannot Wish You * JESUS CHRIST SUPERSTAR: Pilate's Dream * KISMET: Fate * KISS ME, KATE: I've Come to Wive it Wealthily in Padua * KNICKERBOCKER HOLIDAY: There's Nowhere to Go But Up * LITTLE MARY SUNSHINE: You're the Fairest Flower * A LITTLE NIGHT MUSIC: In Praise of Women * MACK AND MABEL: I Won't Send Roses * ME AND MY GIRL: Leaning on a Lamp-Post * MERRILY WE ROLL ALONG: Good Thing Going * LES MISERABLES: Empty Chairs at Empty Tables, Stars * MILLE. MOSISTE: I Want What I Want When I Want It * THE MOST HAPPY FELLA: Joey, Joey, Joey * MY FAIR LADY: I've Grown Accustomed to Her Face * NINE: Guido's Song, Only With You * OKLAHOMA : The Surrey with the Fringe on Top * OLIVER : My Name * ON THE TOWN: Lonely Town * PIPE DREAM: All At Once You Love Her, The Man I Used to Be * PROMISES, PROMISES: Promises, Promises * SHE LOVES ME: Ilona * SILK STOCKINGS: All of You * STREET SCENE: Wouldn't You Like to Be on Broadway * THE UNSINKABLE MOLLY BROWN: I'll Never Say No * WHERE'S CHARLEY: Once in Love with Amy.